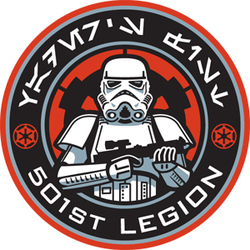 Since 1997, the costuming organization known as the 501st Legion has spread the magic of the Star Wars genre worldwide through its authentic-looking costumes, and has become the leading force in fan-based charity events. The 501st, also known as "Vader's Fist", is truly dedicated to brightening the lives of those less-fortunate. If you use information from this page, a link to AnimeCons.ca would be very much appreciated.